Creates video from frames captured at set intervals. Record high frame rate video, play it at a low frame rates, form the slow motion video. Record video and capture Time Lapse photos at the same time. Record a continuous video loop and overwrites itself until you press the shutter button to stop it and save. YI 4K+ Action Camera makes it easier to shoot in low light conditions. It senses the changes of light condition with the CMOS sensor, and the ISP processor will adjust the frame rate and parameters automatically to produce the highest image quality at low light. Count down, then photo capture. Press the shutter button to capture a series of photos. Capture a series of photos at timed intervals. Only for Photo Mode, Timer Mode and Time Lapse Photo, which determines the length of time needed to open the shutter. 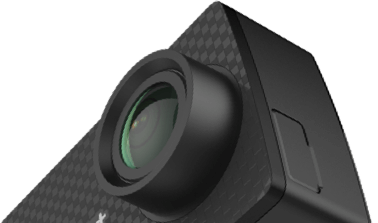 YI 4K+ Action Camera comes with multiple high-level settings, such as up to 30 seconds of exposure time, EV compensation settings, ISO, Metering Mode, White Balance and etc. With 9 shooting modes, you can shoot like a professional photographer. Users can adjust the white balance settings to change the overall color of the video or photo. Automatically adjusts the white balance via environment, without human intervention. Change the camera sensitivity to light in low light conditions, in order to enhace the brightness of the videos and photos. In low light conditions, high ISO value will grant a brighter picture, but will also increase the noise level, making it grainy. Lock ISO: The ISO will be locked when in manual mode of shutter speed and max ISO, generating a more stable video quality; better for post-editing. It influences the brightness of the video or photo. When shooting in a contrasting light environmental conditions, you can adjust this parameter to control the brightness of the video or photo. Value adjustment will increase the brightness of the video or photo based on the default basis. divided into high, medium and low grades. Connect via USB Type-C cable, preview and playback videos and photos, or copy files from the microSD card to your computer. * The RCA and microphone adapter will be sold separately. It’s easy to preview and play back of videos and photos on the LCD. Use YI Action App to preview and play back videos and photos. Connect via USB Type-C cable, preview and play back of videos and photos or copy files from the microSD card to your computer. Preview and play back of videos and photos on your TV via the optional cable. 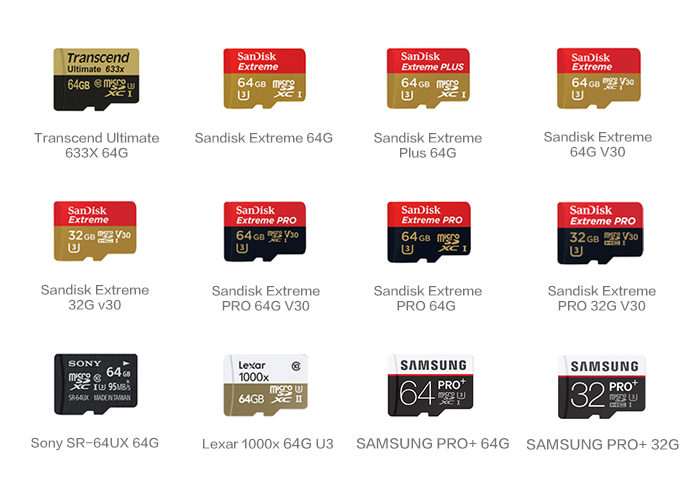 For consistently reliable and high quality 4K recording, we highly recommend using the microSD cards (16GB~64GB) shown below. UHS Speed Class 3 (U3) at least. High-density lithium polymer battery. 3.8V, 1200mAH. The chart below indicates the approximate continuous recording time (hour:min) you can expect when shooting in various video modes using a fully charged battery. Built-in Bosch BMI160, 6-axis gyroscopic, provides precise acceleration and angular rate measurement. Tricolor power indicator(red,blue,violet),a red status indicator.